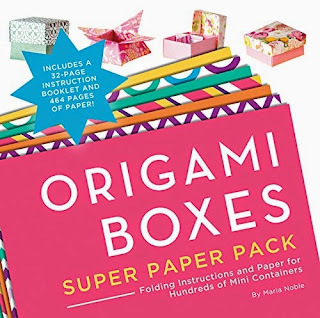 My origami loving heart is just thrilled with these books/kits. The books have a double handful of projects each. The flowers book is a little more difficult than the boxes book, and some of the projects do involve cutting and/or gluing. They also come with HUNDREDS of sheets of paper in different patterns with colored backs. So you can choose a plain color to accent a pattern in a model that requires 2 sheets of paper. Like using a solid base for a lidded box, and a pretty pattern for the lid. Of course, I'm wild for patterns so I'm mostly pattern side out. That's okay too, because a lot of them coordinate very nicely. 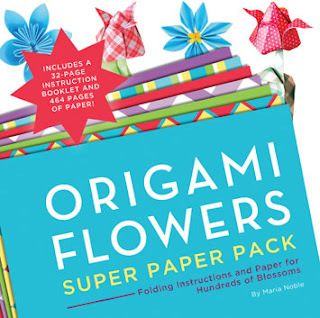 There are over 200 papers in each set, and different patterns for each set. 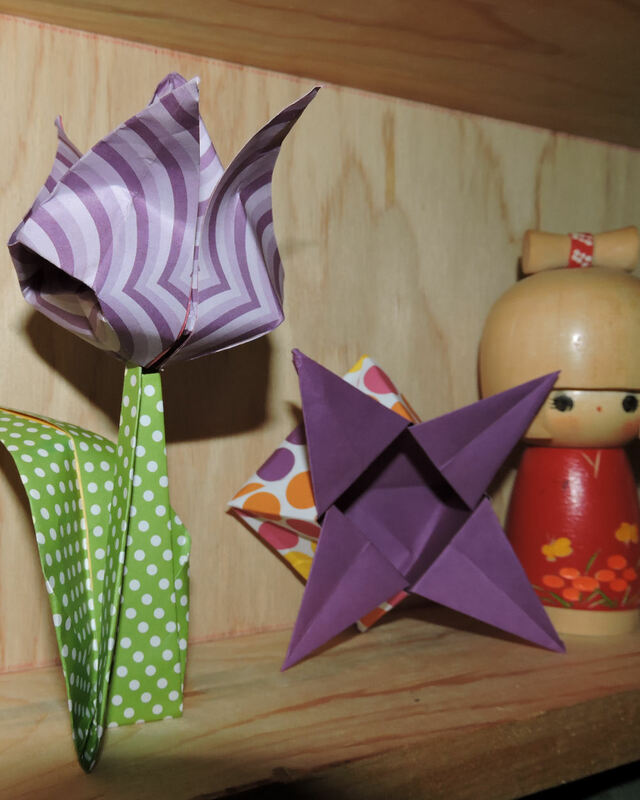 The paper is a bit heavier than traditional origami paper, but it holds folds well and stands up to quite a bit of abuse. Unfortunately, taking a picture of the tulip I made, it did not hold up to be dropped twice. Eek! So my tulip looks a little crushed here. That's my own fault! The projects are easy to follow, the directions aren't in traditional format with symbols, they are carefully explained step by step with very clear photos. My favorite of the two books is the box book because I really like boxes. It has my favorite- a traditional masu style box, with a divider.The boxes are all very functional and decorative, so they make a lovely way to package a small gift. Check out Maria Noble's webpage- St. Jude's Creations .